As we gathered a week later as leaders to discuss this we came up with a few reasons why our rooms seemed so quiet that night. The Holy Spirit can be a hard concept to understand and discuss intellectually, for anyone, let alone teenagers. Many of the teenagers had just come from an event titled “The Rapture” at another church, and probably weren’t in a frame of mind to discuss something as seemingly intangible as the Holy Spirit, when their minds were on more eschatological/apocalyptic topics. We as adults probably hadn’t processed our own thoughts and feelings about the Holy Spirit, so we might not have been in a place to really draw out ideas from our students. As we are created in the image of our creator, we are also part of the art of creation. This is an incredibly powerful image for students to embrace, especially in a world where so much of our energy is used to destroy. We destroy the environment, other’s created in God’s image through war, poverty, and even gossip in middle school hallways. Here students have a chance to participate in the work of creation through art. We offered Kinetic Sand, Play-Doh, paper and gel pens with the instruction CREATE SOMETHING! 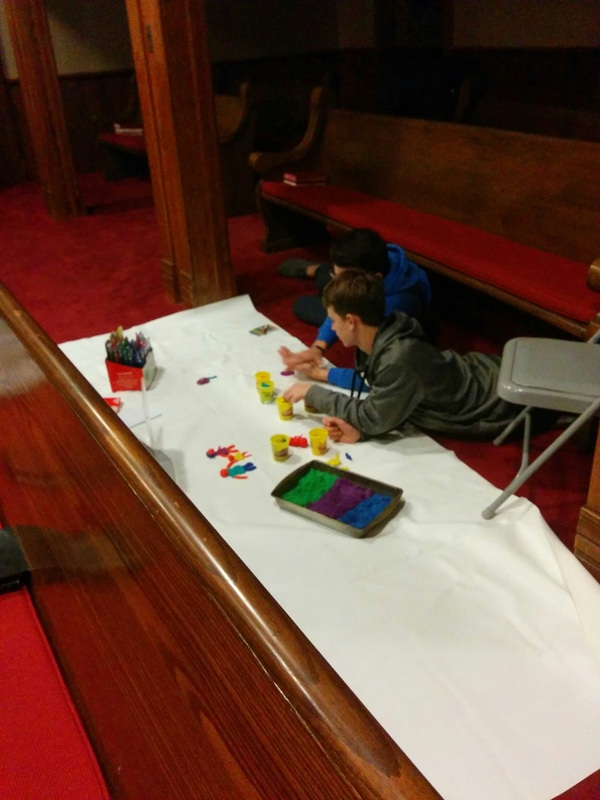 Students made flowers, small doh families, landscapes and simply worked with their hands, all while reflecting on the Holy Spirit’s presence since the beginning of creation. One of our students (actually the one pictured above) said that the comfort station was the most revealing to him about the Holy Spirit. He hadn’t thought about the Holy Spirit being the comforting presence of God. Part of that is due to our language. We don’t often do Holy Spirit language well. We ask God to comfort the sick, but don’t think about God’s presence moving through and being active in the world as the Holy Spirit. I purchased cheap fleece throws from our Walmart (I think they were about $2.88) and placed them over the arms of our pews in the back of the sanctuary and students were instructed to simply wrap the blanket around themselves and find a good place to sit and feel the comfort of the Holy Spirit, and reflect on the ways they have been comforted throughout their lives. We use fire throughout our churches to represent the presence of the Holy Spirit, especially in my current church which is United Methodist, the flame is part of our logo. 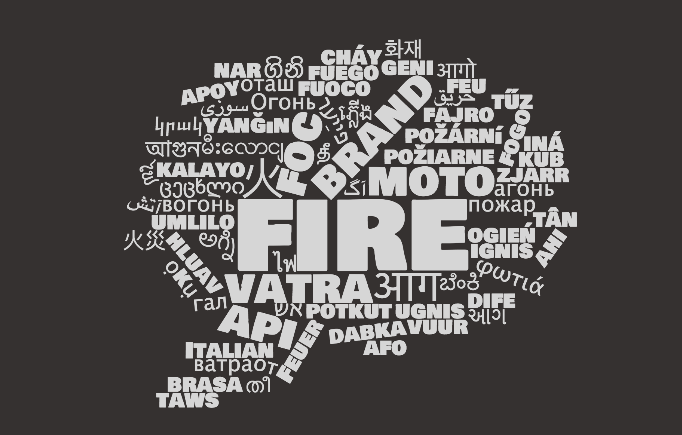 Fire is a powerful symbol as nothing goes through fire and is left unchanged. It is either consumed, converted or purified, mollified, warmed, or steeled, but it is never the same again. The same is said for the Holy Spirit, we shouldn’t be unchanged after experiencing the presence of the Holy Spirit. 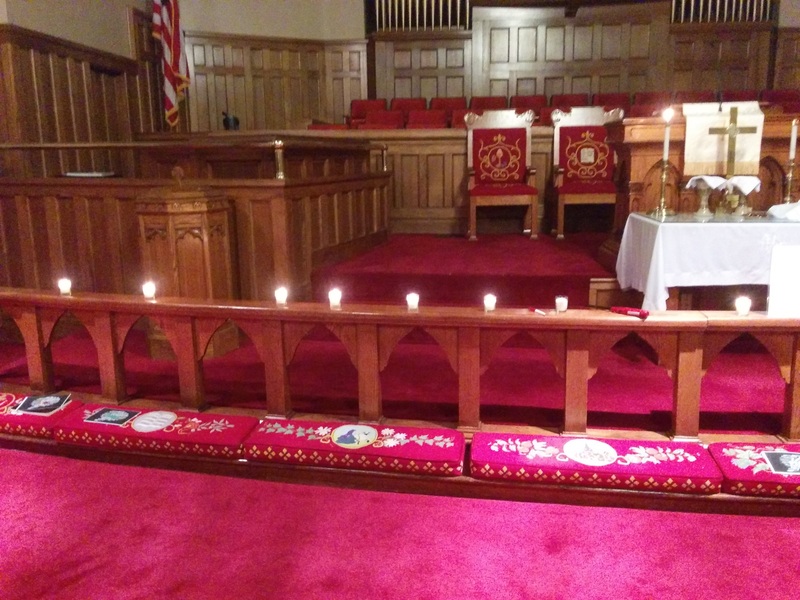 Students were each given a candle and asked to light it and place it on the altar rail, they could simply sit and watch the flame and reflect on the metaphor, or they were also provided a word cloud sheet of the word Fire written in many different languages, to remember the Acts 2 story of Pentecost. The fire prayer station after everyone’s flames were burning. Water is a great symbol for the spirit especially in the context of baptism. We are in a denomination that practices infant baptism, so many students don’t actually remember their baptism, so we use water frequently for congregants to symbolically remember their baptism. 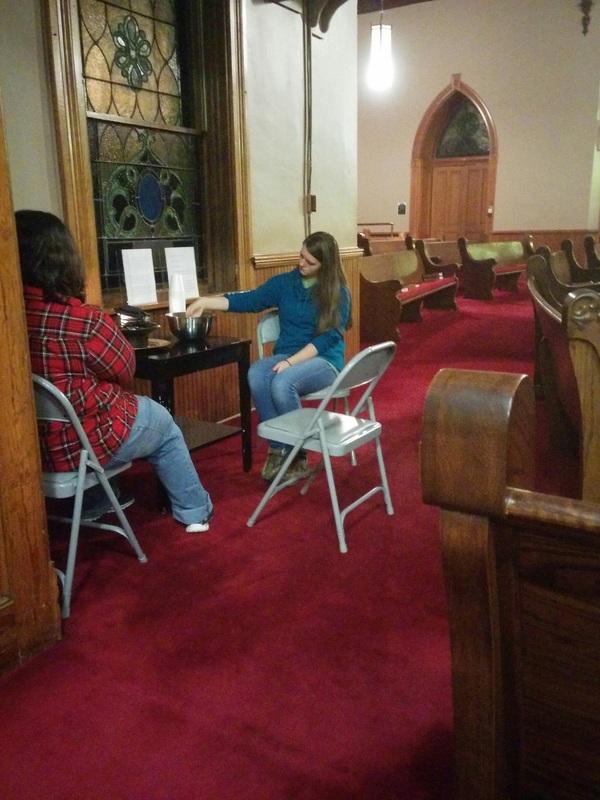 We set up a fountain that we borrowed from another room in the church, and a bowl of water with some cups. The options for this station were to simply watch the fountain (always a good idea to take the bathroom break before you start prayer stations!) or to interact with the bowl of water. They could simply put their hands in, or take the cups and scoop water out and pour it back in. At the end of their time there they were told to dip their fingers in the water and touch it to their foreheads to remember their baptism. Jr High Small Group leader and Senior High student experiencing the Holy Spirit through water. Returning to the Acts 2 passage, this time with the emphasis on the rushing wind. The wind is a fantastic metaphor for the Holy Spirit and one that is possibly easiest for students to grasp, as the effects of the wind can be felt, but you can’t see the wind. This was definitely the most “low-tech” station, we set up an oscillating fan and explained the concept that the Spirit, while being compared to wind can also be compared to breath. We even have part of the word in “respiration”. So a brief explanation of breath prayer was given to help participants focus their time. Exhale: You are Welcome Here. We ended our time together with communion. The elements had already been blessed during a service prior to our gathering, which was fortunate for me, but be sure to follow whatever procedure is appropriate for your congregation. After explaining the Epiclesis (and telling them to put that word in their pocket to impress their parents next communion Sunday) we served each other communion. This was a fantastic way to end our time with each other and to call in the presence of the Holy Spirit one last time. When I asked the students if they thought they could pray for 45 minutes (as that’s how long it took 12 people to do 5 stations) they remarked that they didn’t even think about the fact that it was a) 45 minutes or b) that they’d been praying the whole time! Different forms of prayer, but spending time in the presence of the Holy Spirit in very meaningful ways. I hope that something about this lesson peaks an interest, or opens up a new possibility for you or your group. Please feel free to use any of these, and below is a link to a PDF copy of the scriptures and prayer station explanations, including a sheet with the word clouds that we used as coloring sheets. May the Holy Spirit fill you in your faith journey, Shalom.